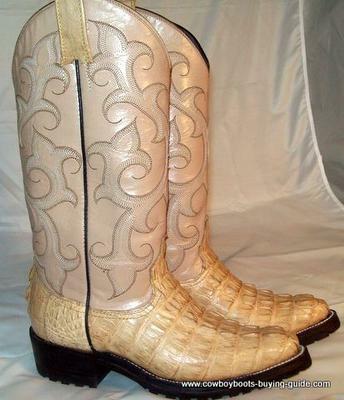 Gorgeous pair of PreOwned Women's Western Genuine Alligator Cowboy Boots, size 5 B with Non Slip Soles. The construction is excellent. 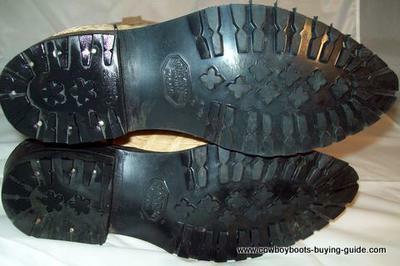 The length is 10 3/4 inches from heel to toe and 4 inches at the widest part of the sole. The vamps are done in Beautiful First Quality Alligator Tail Skin. The shaft is done with Soft Calf Skin. They are 14 inches from floor to top. You have to see pictures to appreciate the beauty. We will sell them for $111 o.b.o. Answer as to the make of these fine boots.. These were made in El Paso, Texas. We're not sure which of the master bootmakers made them but they are very well made. 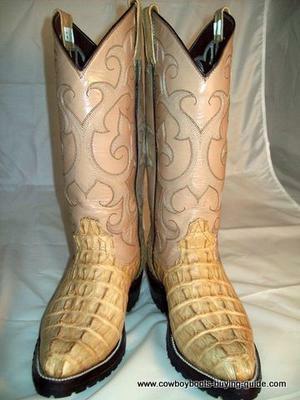 El Paso has a great many outstanding boot makers as there are so many top name manufacturers. Most of them work for these companies and make a few pairs on the side for their customers. 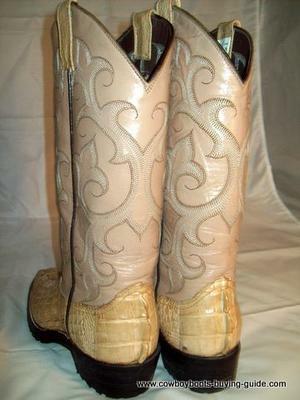 If you are interested in buying these boots please let us know at info@cowboyboots-buying-guide.com.